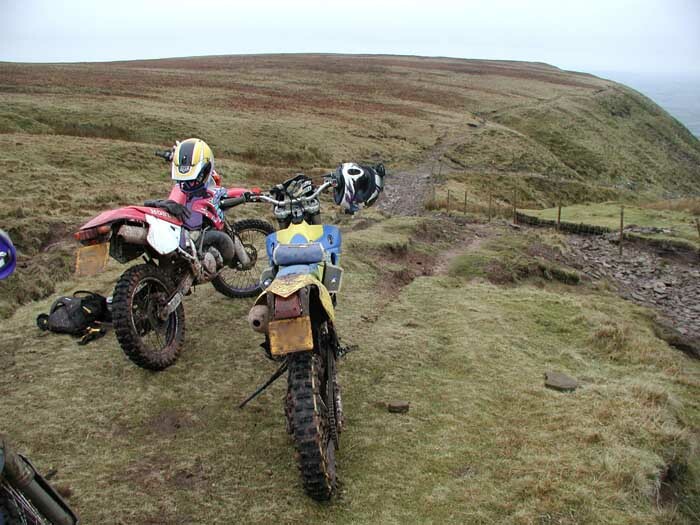 WG&DF MCC: Last of the Summer Wine Club - Trail riding. Last of the Summer Wine Club - Trail riding. OK perhaps we are not all that old but those of us who still have hair definitely dye it mostly white! Whilst the rest of the world was working, Colin, Jules and Rod took a midweek ride through Monmouthshire visiting some potential Wyegate lanes and aiming for Grwyne Fawr. 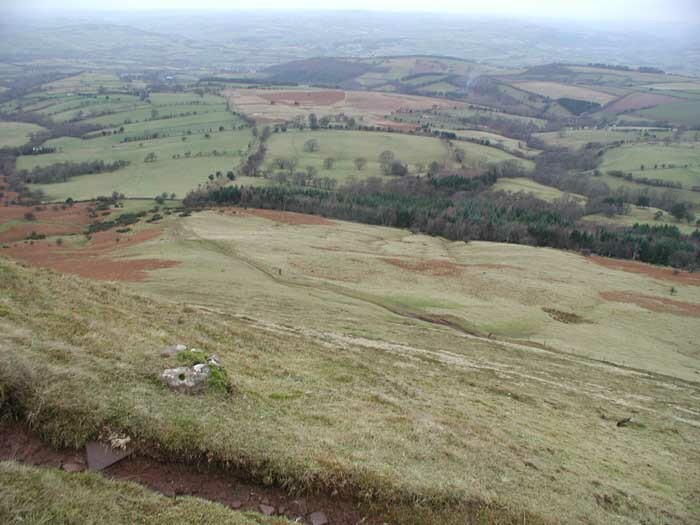 I have to admit to feeling guilty as we sat for a picnic at 2,237ft looking north over the lower hills of mid-Wales. All three wives were grafting their backsides off at home and mine had even made my butties. It was at least 8 years since I had last taken a bike over this track. Rod has ridden a mountain bike and ran all around this area but this was his first time here with an engine. He enjoyed the difficult descent of the scarp slope so much that he kissed the ground while rounding the hairpin bends. 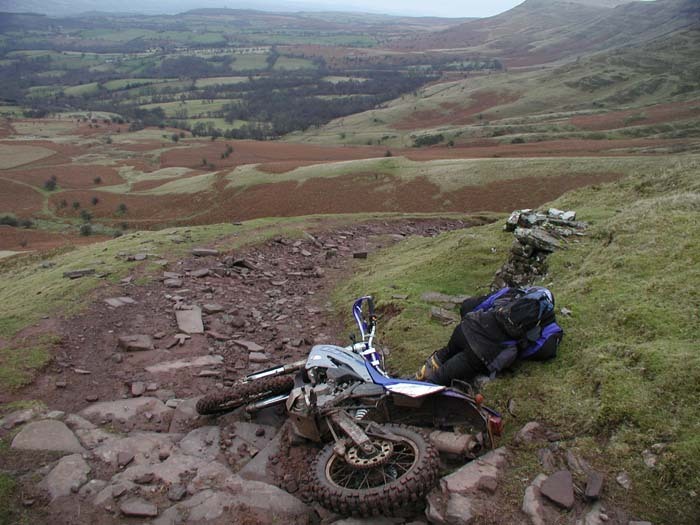 Jules, being blessed with more than his fair share of memory, remembers very early 70's riding the Beacons Enduro (Was it really called an Enduro in those days?) on a Royal Enfield where the evil Bob Perring routed the riders up the steep climb! 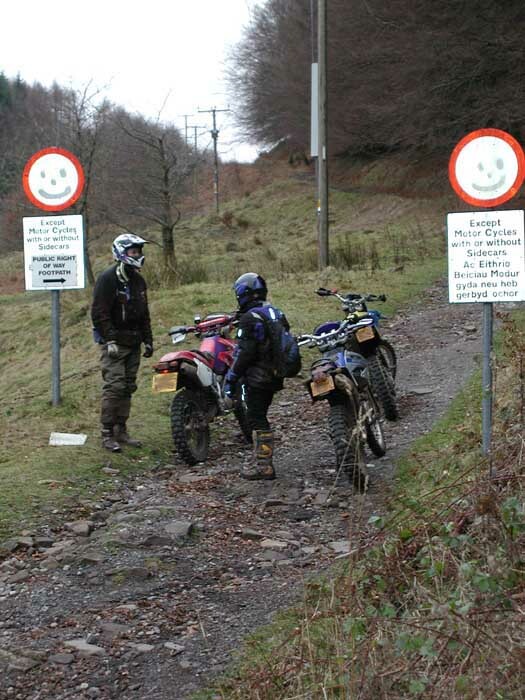 We resisted the temptation to turn around and ride back over, I can't quite remember the reason now! so we rode back through quiet lanes until Raglan where fading light suggested a quick blast (is 50mph quick?) along the old Monmouth road. Rod turned off with his new CCM just run in at 500 miles and Jules and I pottered along the old Wyesham road then Coffin lane back up into the Forest. We met no-one else on the lanes all day despite riding 90 miles. 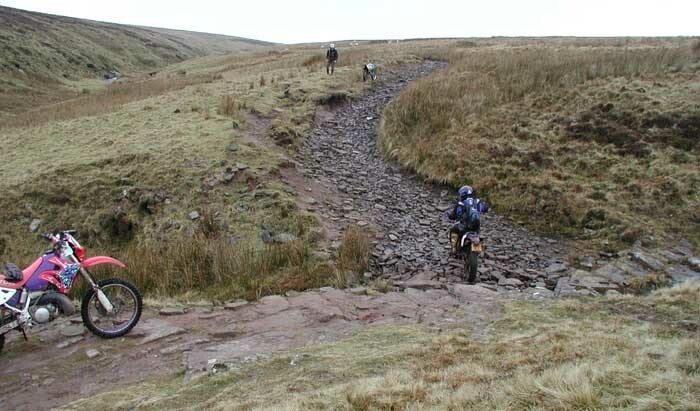 Condition of Grwyne Fawr does not appear to have changed since I first rode it in 1973. Is this good management or just proof that some tracks don't need restrictions. It was no effort to ride with such a small group and GPS guidance at each junction meant we weren't pausing with engines running while maps were unfolded. I think we had very little impact on a very beautiful environment. As they say, when's the next one? One closing thought: If this is Last of the Summer Wine then which of us is Compo?